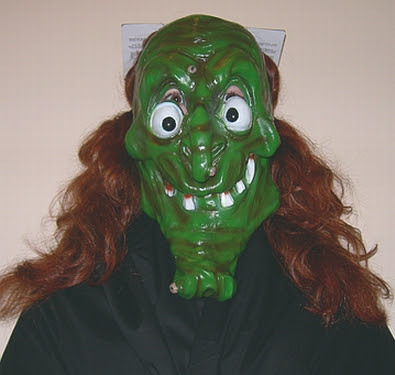 The Drunken Severed Head: A Hallowe'en memory from a monster artist! A Hallowe'en memory from a monster artist! This is my friend John Detrich. 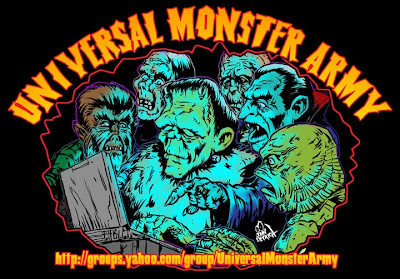 He's not a close friend, but I've communicated with him by e-mail and at the Universal Monster Army message board, and I've spoken with him at a convention (Monster Bash) and on the phone. A soft-spoken, nice guy. But he has a monstrous imagination and an artistic talent that must come from some dark, infernal (but whimsical) power! He certainly seems to be able to draw monsters as if they posed just for him. Clearly, he's the artistic heir to influential talents like Jack Davis, Ed Roth, and Basil Wolverton. Check out his monster art at his site. "I remember Halloween 1970. We were living in Irvine, CA and my dad was in Vietnam. 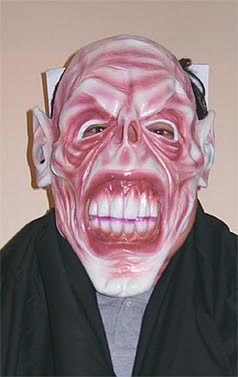 I had a Collegeville Hulk costume and I had cut my tongue by sticking it thru the mask mouth hole. I had grown out my Collegeville Frankenstein one and that was used as window decoration. I remember being worried about finding needles and razorblades in my candy but the worse thing I found were candied popcorn balls. And on the TV (one of those decorative wood cabinet models) were commercials hyping a Halloween night showing of 'Frankenstein 1970' starring Boris Karloff! I was really looking forward to watching it after filling up my pillowcase with neighborhood candy! I imagined Boris back as the monster busting up labs, waving off flames and snapping chains! Anyone who has seen it knows it's nothing like that. What a let down for a monster kid." If you need some retro, stylish masks for Hallowe'en partying or trick-or-treating, John as designed some impressive ones. 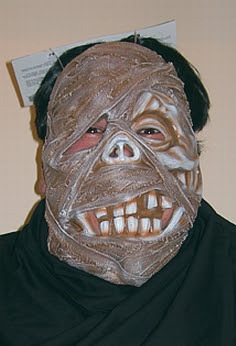 Recently, for Dynamic Design International, he debuted a ghoul mask, a mummy mask, and a witch mask. They can be seen at this page at his site, and there's a link below the images where you can order them. Here's how they look on John and his daughter! These inexpensive masks, when worn on Halloween for trick-or-treating, will earn back many times their cost in candy and treats. Invest in one today! John's stuff is really great. You've been putting up a lot of interesting stuff lately, Max. The hand of glory entry in particular.